As Dramashop's inaugural season wraps, they're planning on celebrating the successful launch of the organization and announcing plans for our second season during the Curtain Call Happy Hour at Calamari?s Squid Row, 1317 State Street in Erie, PA from 5-7pm tonight. 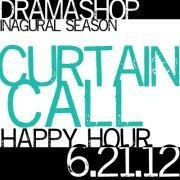 As Dramashop's inaugural season wraps, they're planning on celebrating the successful launch of the organization and announcing plans for our second season during the Curtain Call Happy Hour at Calamari's Squid Row, 1317 State Street in Erie, PA from 5-7pm tonight. The event is at Calamari's TODAY, June 21 from 5:00 to 7:00pm. At 6:00pm, and Dramashop will recognize the many people who made our inaugural season a success and will unveil their plans for a very exciting 2012-2013 season of entertaining and provocative theatrical experiences. I'm proud of what we've accomplished in our first season, and I can't wait to share our season two line-up. We've been working hard to put together a slate of shows that will captivate audiences -- shows that have never been done in Erie before, but that we know Erie audiences are going to want to see. It's an exciting line-up and we're looking forward to getting to work on season two. Over the past year, Dramashop has produced a number of performances such as "reasons to be pretty", "God of Carnage", "The Killing of Sister George" and "The Pillowman".